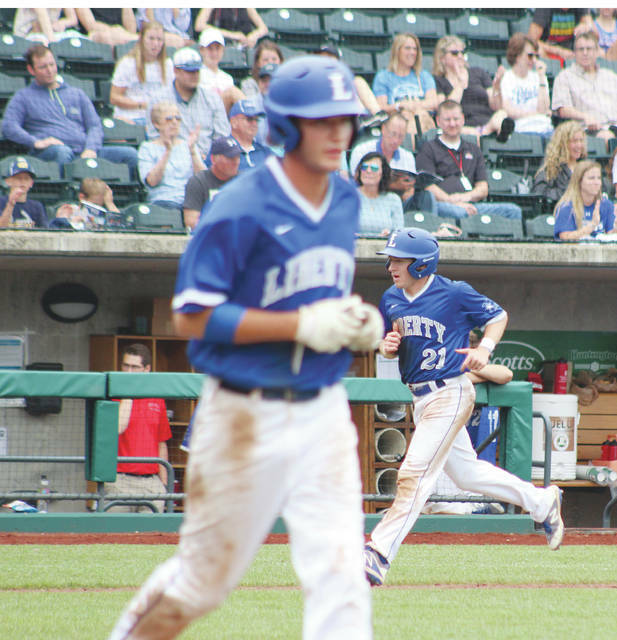 Liberty’s Carson Comer (21) trots home as Corey Mayer heads to first after drawing a bases-loaded walk in the fifth inning of Friday’s Division I state semifinal against Medina Highland at Huntington Park. Olentangy Liberty senior Corey Mayer has come a long way over the last 15 and a half months. So, when he hit a two-run single to cap a four-run first inning in Friday morning’s Division I baseball state semifinal at Huntington Park, he stopped for a moment to take a good look around. He wanted to get a good look at his surroundings. The Patriots (29-4) pounded out 13 hits, worked seven walks and controlled the game from the first batter in a 13-2, five-inning win over Medina Highland. It wasn’t a sure thing that Mayer would have this kind of chance three months ago. He missed his junior season recovering from Feb. 2017 spinal fusion surgery. He said doctors put four screws and rods into his spine. Brenning wasn’t sure he’d be able to play this season, either. Brenning said it was a muscular problem. He held him out of practice and scrimmages at the beginning and used him sparingly in the team’s spring trip to Myrtle Beach. Mayer went from being a starting third baseman on the 2016 team to a hopeful starting second baseman after the surgery to a designated hitter, who gets pinch-ran for in some situations. Through it all, though, he’s thrived. Mayer led a Liberty team that put up video-game numbers Friday. He reached base all four times with a double, a single and two walks and drove in a game-high four runs with a RBI single in the third and a bases-loaded walk in the fifth. Corbin Parrish had three hits in four at-bats and scored three runs, Justin Nelson went 2-for-4 with 2 RBI and Mitch Milheim added two hits and drove in three runs to highlight an offense where each of the starters reached base and either scored a run or drove in a run. The first five reached in the opening frame. Brennan Rowe had a RBI single to break the scoring seal and Carson Comer scored on a wild pitch before Mayer’s big blow. For Milheim, who started on the mound for the Patriots, it was business as usual. He set down the side in order in the first, third and fourth innings. Billy Keller had a RBI single and Ryan Chema worked a bases-loaded walk as the Hornets sent eight to the plate to cut the deficit to 4-2 in the second. Milheim responded by retiring the final nine batters he faced before giving way to Beau Foster for the final two outs of the fifth. The Liberty offense responded by sending 10 batters to the plate to score four runs in the third. Milheim provided the big blow with a two-run single. Bryce Budzinski took the loss for the Hornets (19-10). He allowed eight runs (all earned) on eight hits and three walks. Next up, Liberty faces Whitehouse Anthony Wayne at Huntington Park for a state title today at 4 p.m.